The Xclusive Weeks featured destination this week are the destinations along the Jersey Shore. Keep reading for a summary of this beach vacation spot, as well as instructions on how to get access to last minute travel deals through Xclusive Weeks. Visit Wildwood’s legendary boardwalk for some serious old school summer fun at the number one family destination on the Jersey Shore. There are three amusement piers featuring more than 100 midway-style rides and attractions, including world-class roller coasters and three beachfront waterparks. Elsewhere on the island, you can partake in jet skiing, parasailing, surfing and speedboat rentals, or just chill out and swim at the beach. At night, Wildwood comes alive with grown-up fun. Relax with a few friends at one of the Wildwood’s many dance clubs, Irish pubs, lounges, sports bars or hot spots. There are also historical museums, classic east coast lighthouses, mini golf, sportfishing, great family restaurants, wineries and breweries. Wildwood’s got it all! With the tagline of America’s Greatest Family Resort, Ocean City has a lot of expectations to meet. It delivers with everything you’d expect from the Jersey Shore: bike riding, beach fun, shopping, and the world famous boardwalk. Enjoy eight miles of beaches on the bay side of the shore, miles of bike paths to explore, shopping downtown, year round fishing action, tennis, golf, water sports, yoga and even surfing if you’re up for it. The 2.5 mile long boardwalk is a family tradition for many, and you can be entertained for days on end with the people watching, dining, carnival rides, shopping, mini golf, music, water slides, and beach. It’s shoulder season on the Jersey Shore, but it’s not too late to capture a bit of the summer magic that makes Brigantine Beach so special. 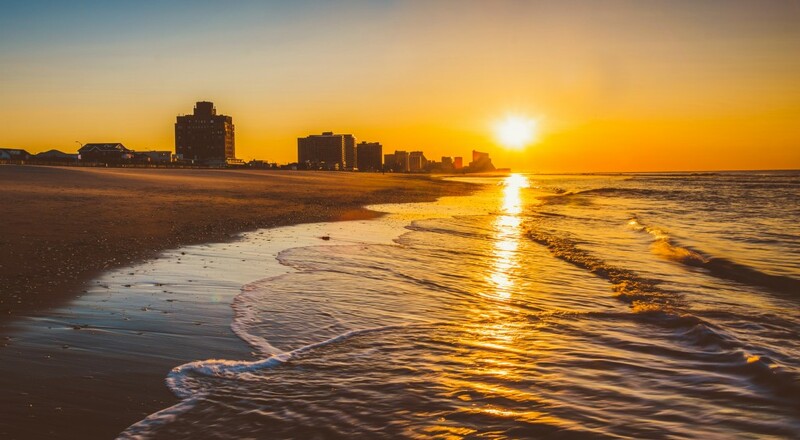 Located just north of Atlantic City, Brigantine offers sailing and kayaking in the natural areas, or swimming and relaxing on the gorgeous beaches. There’s also ample bird watching opportunities, fishing in the bays and offshore, parasailing, jet skiing, scuba diving, and surfing. Ocean lovers can also visit the Marine Mammal Stranding Center and Museum. Established in 1978, it’s the only rescue facility in the state that handles sick and injured marine life like whales, dolphins, seals and sea turtles. When the weather turns chillier, visitors to Brigantine Beach can always get their thrills at nearby Atlantic City- it’s only 10 miles away. It’s fun in the sun season on the Jersey Shore. It might be difficult to believe that this quaint, coastal town is located just a few miles from Atlantic City. Although the sky-high casinos can be seen glimmering in the distance, Ventnor City harnesses all the charm of a quiet seaside retreat, with stretches of beaches, salt-worn cottages and turn of the century bed and breakfasts. Enjoy sweeping views of the beaches and the vastness of the ocean with a walk along the 1.7-mile Ventnor City Boardwalk, or venture out onto the Ventnor City Fishing Pier, where you can watch or join anglers looking to reel in a saltwater catch. During summer months, catch an open-air movie or outdoor concert at Newport Avenue Beach. Do you want to visit the Jersey Shore or one of the many other Xclusive Weeks amazing vacation destinations? Simply call RTX at 888-988-4RTX today and talk to a representative who will give you accommodation options. Want to find out more about Xclusive Weeks? Click here!